Moose season is the time of year I anticipate most. I love the challenge of pursuing them in northern Ontario along muskegs and riverbanks. If you’re like me, maximizing time afield rather than around camp is a top priority. Here’s some practical advice that will take the challenge out of organizing and setting up so you can focus on the task at hand — bringing down a moose. 1. Gear Check Warm and comfortable accommodations are crucial to a successful camp. 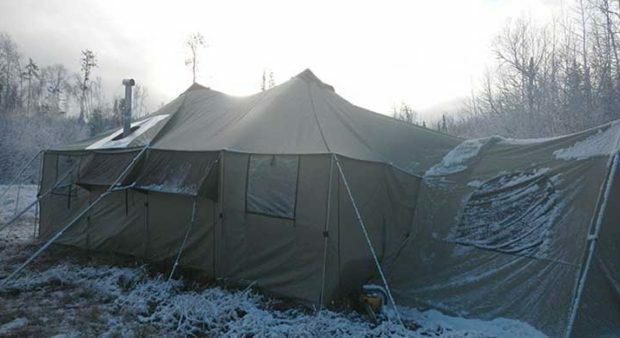 If you use a prospector-style tent for your home base, set it up in the backyard before you leave for your hunt. This has made our team efficient at setting it up at camp. It not only gives you practice at erecting it, you have an opportunity to check for damage. This year we set our tent up to find mouse holes in the fly. It was much easier to mend holes at home then discovering and dealing with the frustration of mending them in the bush. While the camp gear is out, add some high heat paint to the portable wood stove. This extends the longevity of the stove and allows you to stay warm, an essential to getting proper rest and drying off wet clothes. 2. Keep a Master List I keep a digital master list of essential items and tweak it from year to year. Colour-coding the list by person helps everyone be responsible for bringing their items and ensures no essentials are left behind. List off a daily menu with itemized food ingredients for each meal. This will help plan for the right amount of essentials such as bread, sugar and eggs, etc. and use space efficiently. 3. Don’t Negate Nourishment The traditional canned beans and jerky are a must, but adding a few specialties will keep your energy reserves full. Consider bringing some pre-made hearty meals like stew, stroganoff, or other dishes of the like that can be easily and quickly heated. Home canned soup, fruit and veggies are also good when looking for healthy meals while minimizing food preparation time. (Check out these great hunt camp cooking tips) 4. Tent Tactics When setting up a tent, pay attention to the local topography. Higher ground, preferably on well-drained soils, such as sand, is ideal. Being sheltered from prevailing winds can save a lot of headaches, too. If possible, think about setting up within bucket-carrying distance of a water body. Our tent comes with a vestibule that really helps keep the main tent quarters of the tent clean and our hunting clothing scent free. An addition to your tent door with a tarp for walls and floor propped up with aluminum or homemade wooden poles, or a separate room reserved in the cabin would do the same. We also have a slippers-only rule inside the tent that really helps keep the living quarters clean and dry and lessons clean up time. 5. Safety My first aid kit accounts for remote location emergency. A water-tight container can be filled with emergency items from your local drug or dollar store. Include items that will not be within timely reach, such as antihistamine, thermometer and wound closures. Some businesses specialize in ready-made first aid kits catered for remote activities. A small ABC fire extinguisher is also a good idea for the wood-heated cabin or tent. Before I leave home I like to find out where the closest hospital is in case of emergency. 6. Mapping Google Earth is a great free tool for hunters. Printing off maps of your hunting area is fantastic for interpreting natural features such as forests from wetlands or habitat edges that may serve as wildlife corridors. My secret weapons are forestry management plan maps. These contain unique information such as known moose concentration areas and logging features. I get a few copies of the maps of our area printed on waterproof paper each year. 7. Storing the Moose Moose hunters know that the seemingly endless hours of set-up and scouting doesn’t guarantee that you’re actually going to harvest a prized animal. Some of you may have been hunting for years and never brought in more than a partridge. But, if this is your year will you be ready to store what could be a half-ton animal? Be sure you have some sort of refrigeration plan in place. This can be remedied with a generator-rigged chest freezer on a trailer. Another option before leaving home is pre-arranging cold-room space with a local outfitter or butcher. Doing so will prevent the need to race home if you harvest a moose early in the week. These planning tips will help you to enjoy each other’s company, decompress, and focus on the hunt. You won’t be worrying about anything other than how to pull a monster out of the muskeg! Keeping a low profile is generally the ruling principal of deer hunting, but at times getting aggressive is the ticket. Two bucks brawling often means a doe is nearby and ready to breed. The sound of the scuffle will often signal other bucks to head to the area to either run off the other suitors, or sneak away with the doe while the other boys are fighting. When to Get Angry If you hunt a large area of land where the bucks are spread out or if your grunts and bleats have gone unanswered, mimicking a fight might be your best option. Fighting noises during the first 3 weeks of November can make a white-tailed act more like a muskie following a spinnerbait then a reclusive ungulate. Rattle Big Sparing males make a major racket. Antlers bash together, branches break, hooves pound ground, there is grunting, and undergrowth goes flying. One of the biggest mistakes hunters make when they rattle is that they are too timid. When rattling, success often lies in going big. Execute the Brawl Once you’ve found a likely location (an area with lots of general deer sign, fresh buck rubs and scrapes, or a funnel area such as a narrowing of a ridge or strip of cover between two bigger blocks of timber), just sit and let the area settle for 5 to 10 minutes. Scan the woods for visible deer. If there is none, start calling. Buck fights are more like pushing matches than sword fights. Since I often call from the ground, I clash the antlers or other rattle imitation call as loud as possible while stomping and sweeping the ground litter around. The loud initial clash of antlers gets the deer’s attention and since buck fights are more like pushing matches than sword fights, the stomping of your feet and stirring of the underbrush simulates the two bucks moving back and forth, hooves digging in for traction. While you rattle, use a grunt tube. Adding a few grunts really helps increase the audio-illusion. Also, don’t be afraid of raking underbrush with the antlers or your hands to make even more noise. The opening sequence of the rattling should last about a minute to a minute and a half. Once the woods absorb the first volley of sound, wait a minute then add a second fight sequence about half as long as the first. After this, put the calls down, watch, and be ready to shoot. Waiting Game While I’ve had deer come to the calls as long as half an hour after the last sounds, most will show themselves within 10 to 20 minutes. If you’re hunting a spot where bucks are moving through regularly, rattle every 20 to 25 minutes. If you have a number of likely buck hangouts, hit as many of them as possible during shooting hours. Many bucks will come in fast but the majority sneak in, so stay still and keep your eyes and ears open. It’s spooky how a big buck can simply materialize from the thicket and evaporate just as quickly if they see or smell something they don’t like. Stay alert and be ready to shoot. This fall, break norms and start making noise while you rattle. This has filled many a buck tag for me, and it will for you too. A huge black bear, taken early in the 2012 bear season, now stands as an Ontario muzzleloader record for bear. 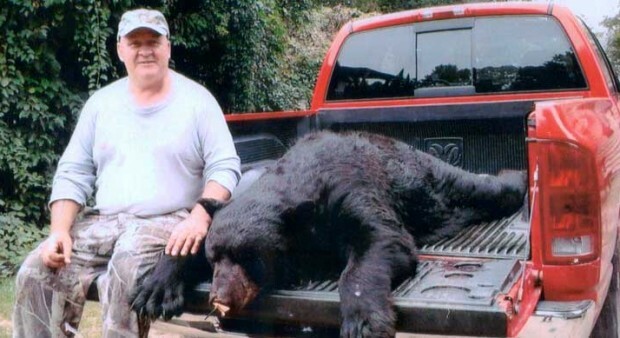 The black bear, taken on September 4, 2012, measured 217⁄16 inches. That easily surpassed the long-standing 2015⁄16-inch bear record taken by Guy Stackhouse in 1995 near Dwight. The bear dressed out at 424 pounds and he estimated it weighed about 525 pounds live.“Its paws were almost 9 inches,” he said. Shot with a .50-calibre muzzleloader.